Media companies are in the midst of a massive shift in revenue strategies from one primarily focused on advertising to one that is more diversified. Without a doubt, subscriptions are highly attractive, given that they guarantee a steady stream of income that is far less volatile than the digital ad market. Ads probably aren’t going away anytime soon, but media outlets are looking for new ways to monetize beyond the traditional ad, and subscriptions offer one way to do that. As Facebook and Google dominate the ad market, media companies have had little choice but to look for other ways to make money. The Wharton School’s Knowledge@Wharton blog published a post in November, The End of Digital Advertising as We Know It, which suggested that even Facebook could be facing an ad revenue shortfall sometime in 2017. “Facebook has said that ‘ad load,’ or the relative volume of advertising versus content on its pages, isn’t going to be able to fuel revenue growth as much as it has to date,” according to the blog post. Certainly issues like “ad blindness” and the rise of ad blockers has contributed to worries about ad-driven revenue. However, the attraction of incorporating subscriptions into the mix also reflect the practical limits of the ad model and the advantages of securing a steady stream of income from loyal subscribers. Certainly, software companies have seen the subscription light and heeded the siren’s call of recurring revenue. As an example, Adobe has completely transformed from a company that once sold boxed software to one that sells subscriptions – and has thrived under the new approach. Media companies believe they can get a piece of that recurring revenue action and gain the same advantages as software companies. Robbie Kellman Baxter, principal at Peninsula Strategies, a firm that works with companies making a shift to subscriptions, says subscription revenue works best for media outlets with a specific focus. “Subscription models are the answer for many of the best content providers, especially those with content that is targeted for a specific audience. The more specific the audience, the more likely subscriptions will appeal to them,” she explained. 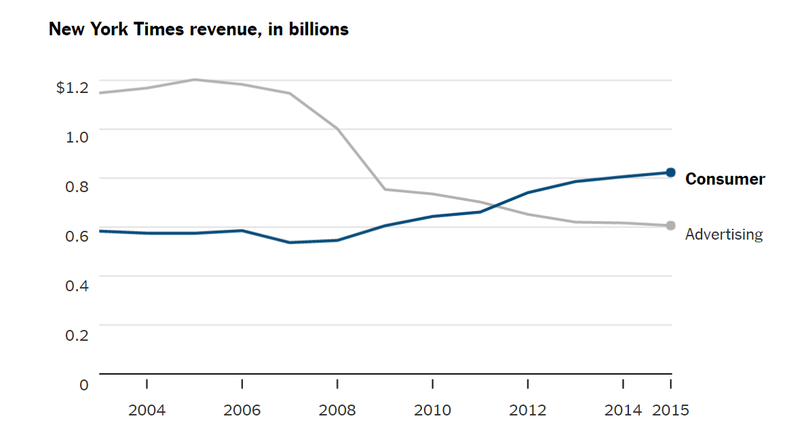 The New York Times is a great example of a company that is making an aggressive push to grow its subscription revenue. It recently published a report that shows subscription revenue has surpassed advertising as the company’s primary revenue source. The company now has 1.5 million digital-only subscriptions, up from one million a year ago, and from zero just six years ago. While the New York Times doesn’t see ads and subscriptions necessarily competing, the company is clearly putting more focus on the subscription business and is hoping the quality of its content will drive more interest over time. “We consider ourselves a subscription-first business. We believe that the best business strategy for The Times is to provide journalism so strong that several million people around the world are willing to pay for it,” a New York Times spokesperson said. And The Times is not alone. Eric Hellweg, executive editor at Harvard Business Review, says that focusing on subscriptions is really about facing the reality of a changing ad market. “It’s pretty tough out there for ad-based media businesses if you are not Google or Facebook. And I think that it’s becoming clearer to media executives that the ad market is goIng to get tougher in the foreseeable future. It makes a lot of sense to look at subscription models as a possible way forward,” he said. Baxter says that the shift to subscriptions requires a fundamental focus on audience by media companies. “It is not enough to have eyeballs, they need to attract the same eyeballs, day after day, making their content a habit for their subscribers. This means that they really need to know their audience, and to tap into their changing needs,” she said. HBR’s Hellweg sees it in similar terms. “To get a subscription business right requires some pretty significant changes, that in many ways cut to core of many media businesses. First, you need a product people will pay for in a meaningful way. Then you have to shift to being user-centric, rather than an ad based business, because it’s essential to understand your users and how to serve them,” he said. When you shift the focus to the audience, it opens up new business opportunities, Baxter says. “When you look at what the audience really needs, why they consume your content, you realize that they aren’t just consuming in a vacuum—they might be trying to be successful in their careers, or to look smart to their friends, or to be in the know about their favorite sports teams. All kinds of new options for features emerge including online community, events and advisory groups,” she explained. Realizing that the subscription model could be the best way to go is one thing, but getting people to subscribe is another. It can present a challenge to media companies as they make this change, especially since online audiences have come to expect free content. Jonathan Anastas from The Enthusiast Network, a media company focusing on action sports and automotive enthusiasts, says in 2017 it’s not that difficult to convert people to be paying customers if you appeal to something they’re passionate about. “People seem more willing than ever to pay for access to the content they love. So, the answer seems to be some combination of super high-end quality in the programming itself or how it’s delivered, a reasonable value proposition, an exclusivity window and passionate content or passion around the content. Give people three of those things and you have a paying customer,” he said. Andrew Sollinger, EVP for subscriptions and events at Business Insider, agrees that if the content is good enough, people will pay for access. “Readers have grown increasingly sophisticated when it comes to understanding what makes for high-quality content. So our strategy of converting prospects to paid subscribers is a simple one: we provide enough access for readers to get a real sense of it. Ultimately our coverage sells itself,” he said. As the ad model becomes more difficult to sustain as a primary revenue generator, media companies are seeking alternative ways to make money. While eCommerce, conferences and other means of income certainly offer a way, the subscription model with its recurring revenue stream is one that could be increasingly attractive moving forward, especially for specialty media with something unique to offer the audience.